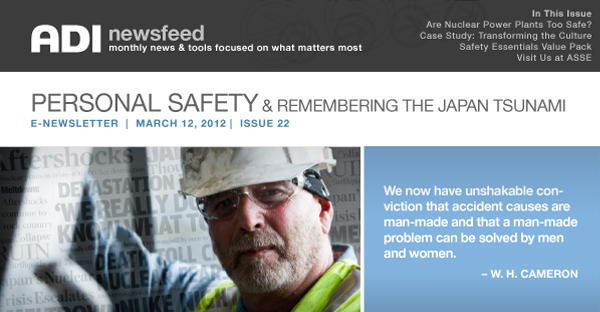 Welcome to ADI NewsFeed, monthly inbox news and tools developed to bring you a focused look at what matters most. With the one year anniversary of the tsunami in Japan, many pause to ask ‘what have we learned?’ The following articles and resources provide a specific look at nuclear safety as well as personal safety of employees and their work environments. Look for upcoming news feeds to cover topics such as delivering expert customer care, performance pay, and fluency. LOOK FOR US IN DENVER! 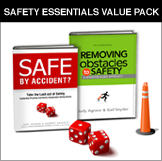 Session #613: Aubrey Daniels and Judy Agnew will present The Science of Safety Leadership: Building a Sustainable Safety Culture on Tuesday June 5 at 10:30 a.m.
Booth #1129: Stop by to get the latest articles, books and resources on workplace safety, safety leadership and BBS.